The chicken company is called Koch Foods and is a multi-billion dollar international business. Its offices are in suburban Park Ridge, but one of its plants is nestled between the Kennedy Expressway and a nice North Side Chicago neighborhood. The Koch plant was there first. A company executive told the I-Team that as he saw the development go up, he thought: "Who in their right mind would buy one of those homes?" But people did, and now residents claim Koch has been nothing but a nasty neighbor. A mid-afternoon shift change at Koch Foods means hundreds of people coming and going. There are cars and trucks, all sharing the same driveway with residents who live next to the plant. "On shift changes I know my kids and I have almost been hit many, many times," said Cara Pollard, resident, Terraces of Old Irving Park. It's a dilemma of urban living: residential neighborhoods butted up against industrial areas. "We knew that they were here, we know they're here. But they don't know that we're here," said Stacey Pearl, resident, Terraces of Old Irving Park. "The noise, the odor, the trespassing." The Koch Foods plant moved from Lakeview into this Old Irving Park neighborhood in 1992. Four years later, the Terraces of Old Irving Park were built. "The real estate people told me, we understand, this is where the phase 3 will be and they'll be moving out soon," said Richard Slosarski, resident, Terraces of Old Irving Park. C.A. Development built two sections of the terraces and tried to purchase this land to expand. But the former owners sold it to Koch, who had already been leasing there. The developer says if Koch ever decides to move, they hope to buy the property and build phase three residences. But in the meantime, the company and neighbors struggle to co-exist. "These truckers are coming off the Kennedy Expressway and they have nowhere to go so they just park along the driveways and are there for hours and hours," said Bob Tataryn, resident, Terraces of Old Irving Park. "There is also a lot of bad smells coming out of the company, decayed meat, it's awful," said Slosarski. Other residents believe the company has been illegally repairing trucks on the property. But this investigation released Wednesday night by the city's Department of Business Affairs and Consumer Protection says Koch Foods was not violating any zoning ordinances at the time of inspection. City officials say they will "continue to monitor this location periodically." A Koch executive tells the I-Team, "We never work on trucks at the property." 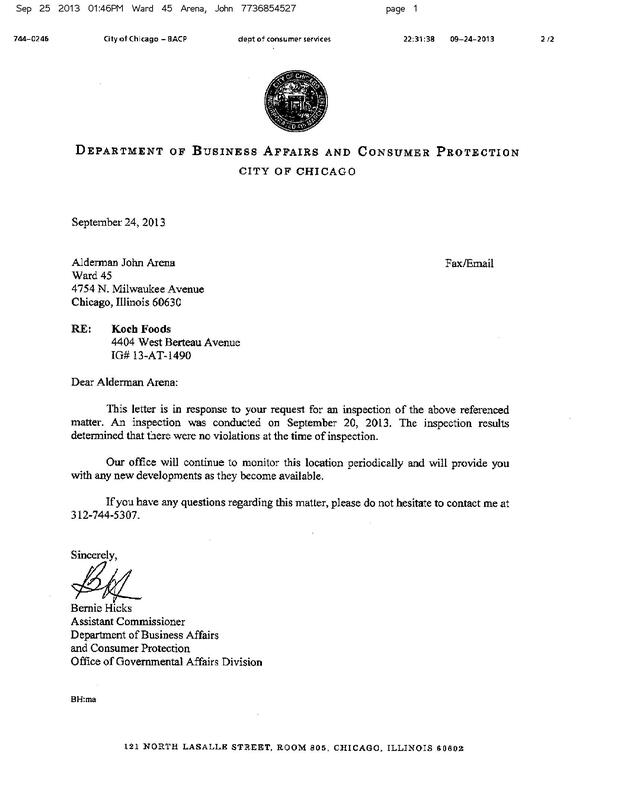 45th Ward Alderman John Arena says he has contacted Koch several times about other complaints. "We have a residential use and a heavier industry use in close proximity, let's work on making sure the line is clear and everybody's roles are clear and the behavior that is defined within the city code is held to and I think we can find a way to live together," said Ald. John Arena, 45th Ward. Alderman Arena says Koch creates jobs and tax revenue and has worked with his office to fix problems in the past. "Even though they've kind of returned to some bad behavior, but they've been responsive in the past and changed their behavior and I'm optimistic we can see that happen again," said Ald. Arena. Koch turned down the I-Team's numerous requests for an on-camera interview. In a statement to the I-Team, the company says when the plant moved to the neighborhood, it was industrial. Koch says it works closely with neighbors to solve complaints, that it provides a lot of jobs and pays taxes to the city. Read the full statement from Koch Foods.